CHICAGO – Seven health care activists were arrested when the refused to leave the lobby of CIGNA insurance company after they were denied a meeting with corporate executives. 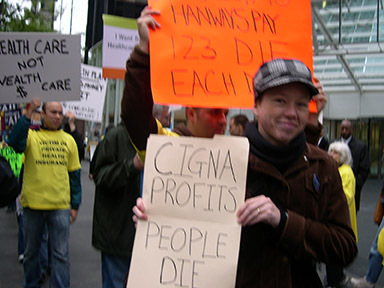 The activists were demanding immediate approval of all doctor recommended treatments by CIGNA. The arrests were part of a national action and aimed at highlighting how the insurance industry drive for profits is resulting in thousands of unnecessary deaths. Crouse said all the insurance giants were equally guilty, but they targeted CIGNA because of a notorious case in which the company denied Nataline Sarkisyan treatment for a liver transplant. Her family fought the decision and forced CIGNA to finally grant the treatment, but it came 2 hours before she died. The delay in approval became a denial of care. 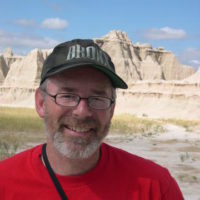 Well-known whistle blower Wendell Potter was also the former head of corporate communications for CIGNA. He has said the insurance industry is forced to cut back on paying claims because of unceasing pressure from investors on Wall Street. Potter recently told TV journalist Bill Moyers, “Back in the early nineties, 95 cents out of every dollar was used by the insurance companies to pay claims. Last year, it was down to just slightly above 80 percent. “So, investors want that to keep shrinking. And if they see that an insurance company has not done what they think meets their expectations with the medical loss ratio, they’ll punish them. Investors will start leaving in droves. Potter said he had seen a company stock price fall 20 percent in a single day, when it did not meet Wall Street’s expectations. Potter also said the insurance industry is deathly afraid of any public competition in the health care field. In fact, the number of competitors has been shrinking due to buyouts and mergers. Back at the CIGNA protest, Crouse said while a single payer health care system wasn’t going to pass in this session of Congress the current reforms being considered won’t be enough to solve the health care crisis. “Single payer may not pass, but it won’t be abandoned. We believe a single payer system is the only viable solution to the health care crisis,” said Crouse. “Single payer is alive and well and we’ll continue to demand our legislators pass it. Everybody in and nobody out,” he said.